No More Threading! 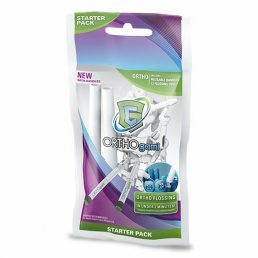 GumChucks ORTHOgami revolutionizes flossing with braces. The thin hook on one end of the disposable flossing tips allows you to safely and quickly position the floss under the arch wire and between the brackets for effective flossing. It isn’t easy to floss with braces – existing Ortho flossers hold the floss in a tight straight line. They can’t make the dentist-recommended “C-Shape” to wrap around each tooth and get below the gum line to remove the bacteria and plaque. 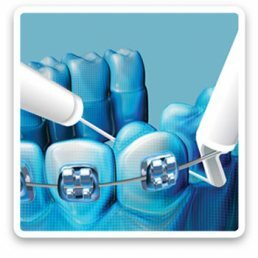 Flossing with threaders can be very time consuming as you have to re-thread between each bracket. With GumChucks ORTHOgami you can floss in under 2 minutes! This product is amazing, pure genius. I bought it for my niece who is 12 years old and has braces. I tell everyone I see who wears braces about it. Flossing is so important and such a time consuming pain in the neck if you have to thread it behind the wire tooth by tooth. This product takes out the tedious task of threading the floss through. I had braces put on and was given floss threaders. I tried to use them, they’re impossible. I found these, and, AMAZING! These are so easy to use . . . If you have braces, this is the tool you need to floss. Takes me 2-3 minutes to do my whole mouth. Great product.